CJ Cangianelli is an author, speaker and life coach. Her new book Thrive! A Life Journal is a guided journal that helps the reader record his or her thoughts, behaviors and progress. CJ was a cheerleader and track and field athlete which led to a lifelong love of sports. Her other interests include stress management, personal improvement and holistic living. In this interview CJ focuses on goal setting for coaches, teams and individual players. 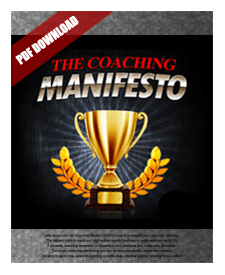 Coaching can be extremely stressful at times and it is helpful to make goal setting a priority. Learn why setting goals is important, how to get started, why many goals are never reached and tips for achieving any goal. CJ also discusses team building activities to help coaches and players.